Manchester United striker Danny Welbeck has been named in England's 25-man squad for the friendly with the Netherlands next Wednesday. 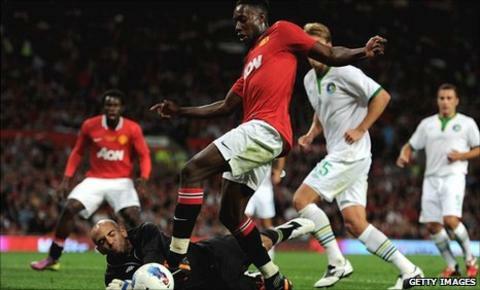 Welbeck, 20, made his international debut against Ghana in March after impressing while on loan at Sunderland. He is selected ahead of Aston Villa's Darren Bent, who revealed on social networking site Twitter that he has a shoulder injury. But Arsenal's Jack Wilshere is included despite an ankle injury. Welbeck scored six goals in 26 league appearances for the Black Cats last season, and was part of the England Under-21 squad at this summer's European Championships. He gets the nod as Fabio Capello's fourth striking option ahead of both Bent and Tottenham striker Jermain Defoe, who struggled for form last season. Manchester-born player joined United's youth team in 2005. Spent the first half of 2010 on loan at Preston, scoring two in eight starts. Bent, 27 was the top-scoring Englishman in the Premier League last term with 17 goals for Sunderland and Aston Villa, and but was part of the England side that struggled to a 2-2 draw at home to Switzerland in June. But although Bent played in Villa's 1-1 pre-season friendly draw against Sporting Braga on Saturday, he has been omitted following conversations with the England backroom staff. Arsene Wenger, Wilshere's club manager at the Emirates, had warned that if the midfielder failed to play against Benfica on Saturday he would "certainly" not play against the Dutch. After having a scan on his injured ankle, Wilshere did not feature in the pre-season friendly, but has been selected by Capello regardless. Wenger told the Arsenal website: "They [England] can include him as much as they want, he will not play." Manchester United's Phil Jones did not make the squad despite reports he had been included on Friday. Liverpool's Glen Johnson has been forced out by injury however, after he limped out of the Merseysiders' 2-0 friendly win over Valencia. Tottenham's Kyle Walker and Manchester City's Micah Richards may deputise in his absence, while centre-back Phil Jagielka has been deployed in the position on the last two occasions Johnson has been missing. Richards only won his first cap under Capello in November and claimed a fortnight ago that he may have to wait for the manager's departure in the wake of Euro 2012 to resume his international career. Following draws against Ghana and Switzerland at Wembley, England will be hoping to secure their first win since March against the Dutch. Capello's side, who are level at the top of Group G with Montenegro, play European Championship qualifiers against Bulgaria and Wales on 2 September and 6 September respectively.